In a previous blog entry I already explained how to setup Single Sign On (SSO) with SAML1.1. In this blogpost I do the same but then with SAML version 2 or SAML2 in Weblogic 10.3.1 server. and choose the SAML2 credential mapping. Now we can go the Federation Services tab of the server configuration and create a SAML2 profile for this server, We need to save this to a file and import this later in the other SAML2 Service Providers. The published site url is very important , choose url of this server , use http or https and add saml2 to this url. SAML needs this url to communicate with the other SAML services. Save this metadata to a xml. This needs to be imported in the Credential Mapping Provider of the Identity Provider ( the first weblogic server). Next step is to go the SAML2 Service Provider tab. Go back to the SAML2 authentication provider where we will import the identity provider metadata xml. Select the identity metadata xml. You have to enable this and most important, fill in all the url's of your applications who needs SAML authentication. In this example I use http but it shoud also work with https and when it fails, please check your url's , don't mix localhost or pc name. Same for the domain name. can you explain your use case. when I think about this you need to make a trust. can you tell me the content of the hidden fields (e. g. Web Service Assertion Signing Key Pass Phrase). I have no idea where to find these passwords/passphrases. Thanks for this post. I implemented this between two weblogic domains and it works. I am facing one problem though: I am able to go from source to destination fine, however, when I go back to source from destination, user gets logged out. It seems jsessionid created by souce gets overwritten by destination. Any ideas would be appreciated. I have some firewall restrictions and cannot expose its/acs URLs. Both source and destination are inside same network. How would it be possible to make the ITS url communication as back-channel without involving Browser. I believe ACS url communication happens as back-channel without going through the browser. what I know you should use the same server names everywhere , so dont mix localhost, 127.0.0.1 , machine name. and use the same server names everywhere , dont mix localhost and your server name. Well it seems that there was an exception with getMessage() == null and CommonSecurityLoggerSpiImpl was trying to log that exception by calling getMessage().toString() and that caused NullPointerException. Anyway I used SAML 1.1 and it works for me. should be the same. Or should be to my second aplication (Destination). In your case, do you have /saml2/idp/login in your destination? it looks Ok, did you have a error. Hi Edwin, thanks for the post! I setup trust between 2 WLS domains following the article. However, I do not get the token generated in the HTTP POST of Idp domain. Do I have to embed the token programatically or simply rely on the selected protocol Http POST to do this.Please advise. 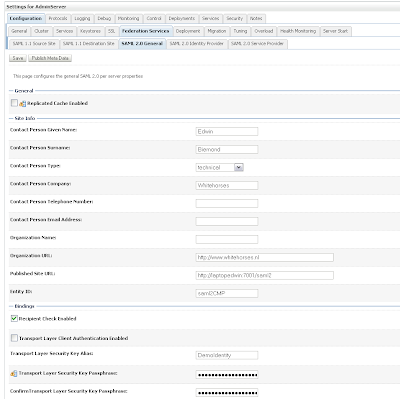 I deployed Simple JSP app with form based auth and after a successful login, I have a form submit to post to an SP page. I have SP JSP app with CLIENT-CERT. Both apps behave as though there is no SSO setup. I do not see anything in the logs even though I have debug options on the domains. What else can I check? I setup trust between 2 WLS domains by following the article. 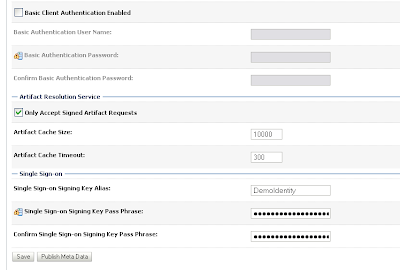 I deployed simple JSP app on Idp with Form based auth. The successful login page has a Http Post to SP page. The app. on SP is another JSP app with CLIENT-CERT. However,I do not get the SAML token generated or embedded in the Html. Do we have to do this programatically or just rely on the selected protocol option "HTTP POST"? Trying to navigate to SP from Idp gives a 401 error. Both the apps behave as though no SSO is setup. I enabled options on logs, but I do not see any. please advise. Is there anything else I can check? Hello how did you solve the 401 problem? What is "I finally got it to work after playing around with protocol options and configuring redirect URL on the SP" about? in the web SSO idp Partner on the samlAP, it seems it doesnt recognize wildcards like /appB/* y put the entire path and it works. please check your url's in both wls config and apps, use everywhere the same machine name, dont mix localhost and a servername or fullname with domain and without domain name. Edwin, thanks for your response. I finally got it to work after playing around with protocol options and configuring redirect URL on the SP. However, there are a couple of things that I request your help regarding. 1. I only see the below in the Http header on a redirect from SP to IdP. Where should I locate the SAML token? I only see the above encrypted message being passed around to authenticate, but no saml. However,once I login, i dont get redirected back to original requesting page on SP. Is there anyway I can seemlessly redirect from SP to Idp login and back to SP? Thanks for your tremendous help!! There is very less help regarding this in weblogic docs, I'll be very thankful. Hi Edwin,I was able to successfully do sso viceversa as per the above steps you mentioned for basic authentication.But i could not able to do with customlogin where i configured in IDP end ,i was not able to navigate from IDP login page to SP do we need to write an code for it.Please advice. Continue to the above i was able to login but i am redirecting to source site rather to SP site.I belive this happening because of jsecuritycheck which is redirecting to source site.How would we change this to redirect to SP in web.xml i,e target application URL.Essentially its SP initiated sso. could you please help me with the above? I verified that I use consistent hostname everywhere. please set the saml debug parameters and you will see every detail. Dont know if you can use a return url. SAML Service Provider or Identity Provider must be created before SAML profile can be published. Otherwise, an error "SAML2 services not enabled" will occur. no I use the default option, no database repository for the myrealm security realm. First thank you for documenting all steps. I was wondering if you would mind sharing the jsp files you have used? I'm sorry to ask, but I'm not a java developer, and have no clue how to write them. Thank very much for the post, really useful! I am trying to implement a SP-initiated use case. For this I have a weblogic server working as a Service Provider and a Active Directory Federation Services working as Identity Provider. 1. Authentication Provider with a SSO Identity Provider Partner. After that I have configured one server as a Service Provider. The problem is that if I ask for any resource (web app) that I have deployed in this server, my request goes straight to the resource (without being asked for authentication). However if I set on the "Redirect URIs" of my Identity Provider Partner, the Weblogic Admin console URI (/console/index.jsp) I am asked for authentication (the IdP answer with the SSO login form). By the way, Thanks in advance!!! Finally I think I got the right configuration of my SP. Now I am being redirected to the IdP login form and I am getting the assertions from it. I think that my problem is in the deployment descriptors of my app (web.xml and weblogic.xml). How can I map the "Groups" attribute of the SAML2 assertion with the "security-role" and "security-role-assignement"defined in the web.xml and weblogic.xml? 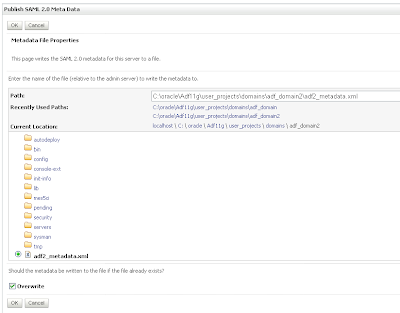 just use the users wls role and map this in the weblogic.xml to a application role and use this role in the web.xml. Every authenticated user belongs to the users role. Yes, you are right!! !If I use the "users" role it works perfectly. The problem is that I wanted to grant access just to a users that belong to a certain group. SAMLIALoginModule: login(): don't get attribute principals, the element in context handler is empty. can you use the users role for the security part and try to display all the user roles. like I do in this blog. Thanks a lot for your answer! I still have not tried your test, for the moment we have added the AuthZ problem in our TODO's list. Please set the log level of the managed server to trace and enable the security logging. and check the logs why you are not authorized. with these I can invalidate the session the page of the Service Provider; and back the login of the Idp. I want to control the session of all SSO from the firs page (Idp), How can I do this? I read your detailed explanation on how to implement SLO for Weblogic by using saml2slo/sp servlet (Re: SAML2.0 Single logout weblogic 10.3 ). I am quite new to Weblogic and would really appreciate if you forward the implementation of servlet for reference to my email address sonikajain0101@gmail.com. Sorry for my late answer, I completely missed your comment. Thanks very much, for your help, then I need develop a session.invalidate(). When I login the appA and I can go the next application (appB) is well in the firs time. But en the second time in the appB the user is no propagate from the appA. This ocurr when I have two domain in two host differents but in the same host is well. you should make a blog about this. Great solution. Have you configured a provider authenticator, identity asserter an credential mapper for both domains (security realms)? 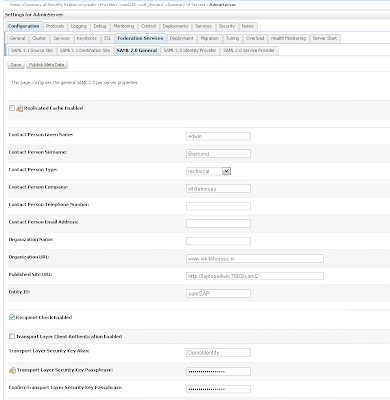 Have you also enabled the debug options for atN, atZ and SAML2? You have explained things very clearly in this article and is easy for any one to understand. The Weblogic documentation is very poor. I tried setting things up according to your article using two local weblogic domains. I could not get it to work. Correct me if I am wrong. After setting up the Identity Provider Instance, I should be able to type in the URL such as http:///saml2/idp/login and be able to see a SAML 2 Login Page, is it not? I do not see this. Is there a SAML Web Application of some sort that needs to be deployed first? I will be there , just provide the right server name and port. don't know you can call it directly. I have developed the SLO protocol for Weblogic. Forget about my previous post Edwin, I got it working. The simple web application on the SP that I was trying to get the authentication from the IdP for was not setup to require authentication. I realized it today and I changed it to require authentication by adding a in its web.xml and it worked. Anyways, again very thankful for your blog. In my previous post I wrote about the problem I am facing during SAML creation. Let me replicate the requirement. I am using weblogic as an Identity Provider and Oracle Identity federation (OIF) as a service Provider. The federation will be IDP(weblogic) initiated. I have configured both sides. I have configured both the sides as per your blog (weblogic and OIF) , published metadata and exchanged. Now the problem we are facing is that we don’t know that any web application need to be deployed in weblogic or any out of box feature is there in weblogic which we can use in order to get SAML working. Is there any out of box feature of weblogic by which we can use SAML after configuration only or we need to write a separate java code in order to create login page and using the entire configuration which I made in weblogic. As my requirement is a bit different from the solution in your blog. I am using OIF as service provider and in your blog weblogic is being used on both the places. I used source site configuration part form the blog (cause I am also using weblogic as an IDP). I configured OIF on my own. Exchanged metadata of OIF and weblogic. IF I had used OIF at both sides in that case my job would be pretty easy (cause OIF is specifically made for this purpose. But our requirement is different as I have to use weblogic as an IDP). In your blog you you haven’t written about any web application which needs to be deployed on weblogic side . What URL I need to hit for SAML if there is out of box feature in weblogic for using SAML(after configuring everything in weblogic). Do you know how can I avoid this error? What could be possibly wrong here? Any pointers would help :) Thanks in advance!! Putting the error messages belo. Seems like it got trimmed off. It seems that it is not able to find the endpoints for your Service Provider. I would recommended to check them. 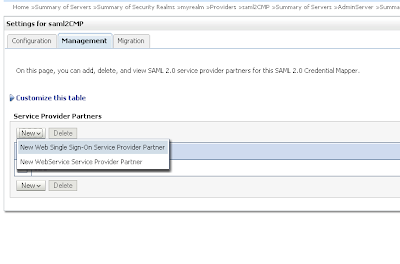 By the way, is the SAML 2.0 Web Single Sign-on Service Provider Partner enabled? I have setup SAML 2.0 WebService Service Provider. don't mix ip , hostnames and full names together. it is very sensitive. Just use hostname + domain names. I get a 400 ERROR because it is expecting a SAMLResponse in the request (HTTP-POST binding). With this simple test I know that my saml2 module at least is working. I can see that yours is a little bit difference, but at the end of the day I think that you will need to declare in your Audience Uri's, "something" that is going to consume your assertion. I wolud begin for checking that. I have also noticed a LDAP search happening before this error is logged. Do we have to setup any LDAP config? I am getting another error. Trying to select key by mechanism: BY_TOKEN_REFERENCE. It seems that WL is not able to find the key to decrypt the encrypted wsee header data. 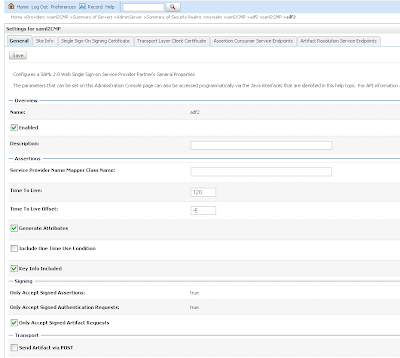 I have configured the correct assertion signing certificate on the WS Id Partner. Any idea what could be the issue? Mmmm, I experimented a similar issue a couple of months ago, but in the other side, this is sending requests to the IdP (ADFS2) from a servlet. For signing the request I was using SHA1 and the IdP was verifying them with SHA256. Just changing the IdP configuration the issue was solved. Thanks Luis. What you told looks exactly the issue. I notice that the algorithm specified in the SAML token is http://www.w3.org/2001/04/xmlenc#rsa-oaep-mgf1p. I am not 100% sure but I think that Weblogic is using the same algorithm signature that is declared in your "Single Sign-On Signing Certificate" (see Home >Summary of Security Realms >myrealm >Credential Mappings >Providers >My Credential Mapper >WebSSO-SP-Partner-0). I am using a certificate using SHA1. Given below are details of this certificate. I changed the algorithm suite from Basic256 to TripleDes in the WS policy, and found that this time it searches for KwRsa15. AS per this Oasis site - http://docs.oasis-open.org/ws-sx/ws-securitypolicy/200702/ws-securitypolicy-1.2-spec-os.html#_Toc161826555. These two algorithms (KwRsaOaep and KwRsa15) are used for asymmetric binding. I believe I need to make use of a different certificate. I will continue searching for more help. If you happen to get any information which can help, do let me know. Currently I have several WLS domains authenticating against our SSO via SAML2, mapping attributes assertions to principals, now the sky is the limit, thanks! Thank you very much for your answer! So, that means, that at the end of the day, in the WLS side, I will have always the same published url for all of the clusters, doesn't it? I have tried with /cluster1_saml2 but I get a "404--Not Found". I think that we get it! In the WLS you keep the /saml2 context in the "Published site URL". Also you will need to say WLS that does not check the Destination field (see in your IdP response) disabling the "Recipient Check Enabled". Any thoughts on this, maybe too much hacking around? at second weblogic I got confused about how could I configure it.because when I went to next step at "Federation Services Tab" to configure SAML 2.0 General I got an alert with this message"you must enable SAML 2 ..."
Sometimes you need to restart weblogic between the steps . I have a few domains running Weblogic and working and authenticating against our SSO via SAML2 protocol, good! I have one WLS that works as a proxy for our Oracle-APEX applications. This proxy gets the user info, custom principal implementation, and adds some headers before redirecting the user to the final APEX-application. The applications perform the user authentication using this headers info, good! Anybody knows if there is an option that allows Weblogic to keep the original request parameters? I don't know much about apex etc but do you use the apex listener on weblogic. maybe you can configure some option there. The configuration for a Managed Server is the same as for the AdminServer. Following your blog steps, I had appA deployed on one server (localhost:7001, ssl port 7002), and appB deployed on another server (localhost:7003, ssl port 7004). appA uses form login, appB is configured for CLIENT-CERT. I set the Identity Provider general services to a published URL of https://localhost:7002/saml2 and an Entity ID of saml2CMP. I set the service provider general services to a published URL of https://localhost:7004/saml2 and an Entity ID of saml2AP. "The webpage at http://127.0.0.1:7001/saml2/idp/sso/artifact?SAMLart=AAQAAApriktiqPxDEvWbV4yOYVVARn3n8HD%2F%2FCFyLwRU%2FokaghAZK%2BqqPAU%3D has resulted in too many redirects. Clearing your cookies for this site or allowing third-party cookies may fix the problem. If not, it is possibly a server configuration issue and not a problem with your computer." The https and the port number don't affect this redirect error. It will happen if I use http and the standard listener ports of 7001/7003. Since I'm a novice at working with SAML2 and SSO, I'm assuming I messed up a config setting. Particularly because these two applications are the same applications I used to configure a successful SAML1.1 environment. Any ideas on what to check? As an edit to my previous post, I meant to say I was getting a 401 unauthorized error, not a 404 error. I'm not sure why I was getting redirect loops, but I needed to use HTTPS anyway because that's my eventual goal. The problem with HTTPS was I kept getting 401 unauthorized errors, even after verifying each configuration step against the screenshots provided. After many hours of troubleshooting with this, I think I figured out how to set up SAML 2.0 using HTTPS reliably. I follow the tutorial settings, but I reverse the SAML 2.0 site configuration steps. When setting up the Identity Provider general services, I save instead of publishing then I fill out the identity provider specific page and save again. Once the provider is enabled, I publish the metadata file. For the service provider, I set up the general services and save. I then fill out the service provider page, but I leave "Only Accept Signed Assertions" set to false. I save the service provider settings and publish the metadata. 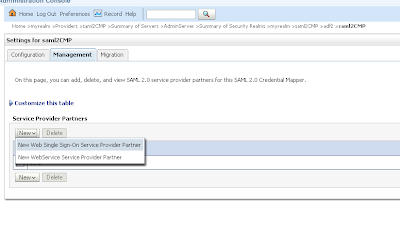 I follow the remaining tutorial steps for configuring the identity and service provider partners. I make sure that I have appA and appB deployed and that both domains have a user account with the same username and password. I go to appA, click the link, and get a security certificate warning (which should be ignored because the certificates are self-signed). If I didn't mess up a step, I get a successful SSO login to the protected resource on appB. Once I have it working, I go back into the service provider configuration page and set "Only Accept Signed Assertions" to true. I save, republish the metadata, and recreate the service provider partner using the updated metadata file. Hopefully this saves someone else a day of headaches. Great, thanks for the update. So it works now for you. I need only a test authentication with saml 2.0, login and logout. How could the easiest way? I am getting below error when I restart the server after creating new SAML2CredentailMapper and SAML2IdentityAsserter on weblogic10.3.4. I have configured custome keystore and SSL.Can you pls advice what I should i do to avoid this issue? java.lang.UnsupportedOperationException: This parser does not support specification "null" version "null"
Could it be an issue in a XML headers? Please review both IdP (for the Identity Asserter) and SP (for the credential mapper) metadata. The latest Apex Listener 2 allows multiple database connections. Has anyone tried SAML2 with this listener or earlier listener and gotten the credential through to Apex applications as a custom login. What do you have to do to get apex to 'find' the userid once authentication takes place? Thank you very much for the info, good to know! We will test it and let you know. We have tested the earlier version of the listener over Weblogic 10.3.5 working as a Service Provider. The trick is to add a listener (javax.servlet) to the APEX listener that takes the username from the principal (java.security.Principal) and "injects it" as a header. Then in the APEX application you just need to use the "HTTP Header Variable" security schema. In this one you will look for the header that you inject it before. In your filter just extend HttpServletRequestWrapper implementing the getHeader methods. Thank you very much for the quick reply. This is very helpful since we are just starting to prepare for installing the Apex listener on Weblogic. My prior experience has just been with mod pl/sql gateway. Can you share more info on the javax.servlet and how you get the username and principal to 'inject it' as a header. 4. You are almost done! Just setup the HTTP-Header security schema in your APEX app using the same headers that you have "injected". Hi, does anyone know of a more complete explanation of exactly how to set this up? (including a copy of the exact filter code required and how to configure this). I'm just learning about it now and I think I'm missing a lot of pieces. In what concern the SAML2 configuration for Weblogic, this post contains everything that you need for the setup. Thanks Luis. I guess the contents of your Step 2 above is missing the actual XML tags, I think I can figure it out..
here is my requirement. please suggest. User will log in to my web application by entering user credentials and click on workflow link then it should use the same credentials to log in to soa suite bpm worklist and should show the bpm worklist inbox directly in a separate page. So I do not want to log in again in bpm worklist. how can I achieve this single sign on? what options do I have? Its urgent. So please provide your inputs. I have setup wl as idp as in the post and salesforce as sp. But I am still not clear how these comunicate. what is the url I need to put in my wls app and what is the url salesforce user can use? Are you re-directed from salesforce to weblogic for a login. Thanks Edwin for providing this wonderful article which helped us to setup a IDP and SP. The SP and IDP are setup and assertions are passed through...We have a requirement to get the post data from SP and make some decisions and we need to pass some custom data to SP along with the saml response. 1) How to get custom post parameters coming in from SP to our IDP in our login application? 2) How to add custom post data on our IDP post to SP?. The reason I ask is because login-return servlet failed to generate samlresponse if the user is not authenticated and we have a requirement to return an error code if the user failed to authenticate like the following. Adding custom parameters on the post back to sp was easy. We posted those data in the post and was accessible in the custom jsp configured. But we are still struggling to get the saml request data in the custom login application and also if weblogic would be able to generate auth failed response. One of the contributors to this Blog, Luis, has helped us get CAS authentication almost working perfectly with Apex listener 2.0 in Weblogic--using the SAML2 approach. We have Apex 4.2 running and in Weblogic we have been able to 'inject' the userid into the header variable and get it into an Apex application. However, we are getting 'stuck' at the point where CAS returns the user to Apex. We are getting to the URL with 'my-apex-server/apex/apex_authentication.callback' and are stuck there with error message saying insufficient parameters. We do not know how to configure so that CAS sends the user back to the calling application URI. We know that CAS is working because when we manually put in the correct application ID in the URI, (after the CAS login) we are able to get to the application and the correct userid is showing. But it is a bit frustrating to be so close and not quite there yet. Thank you very much for the mention, is really good to know that our solution is being useful for somebody else! Have you defined the "HTTP Header Variable" authentication scheme for your apex application (Application Builder > Your Application > Shared Components > Authentication Schemes)? Here you should specify the name of the userId header. Our SSO solution is starting to be used for our users (APEX & Java developers), so good news! But, there is always a but..., we have a couple of issues. One of them is that one of our applications needs to use two authentication providers, SAML2 and LDAP. This is, by default it should use SAML2 and for certain resources use the LDAP. 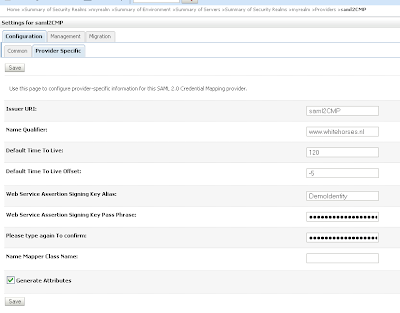 and in ADF maybe do the same and then with ADF security on pages, task flows. Thanks very much for your quick answer! indeed strange , the control flags have sufficient as value. Remove saml2 make it works. The applications try to authenticated against the LDAPAuthenticator first. /secure/* url-pattern mapped to the principal "users"
The only "con" is that now we have to remember to register all the new contexts in the above field. We are a University and among higher ed institutions CAS and Shibboleth are the preferred methods for authentication. We have gotten CAS working with Weblogic by passing the authenticated 'remote_user' to the 'HTTP Header' authentication scheme for a new Apex environment being set up here. However, now we are trying to figure out how to further limit access to applications to specific AD or LDAP groups. Is there a way at the Web Logic level to further filter for the users of specific groups? I know this can be done with DBMS_ldap query within Apex but would prefer if there is a way to do this at Web Logic layer. The other option might be to use Shibboleth since it is supposed to be SAML2 compatible. We will be trying to find schools that have successfully implemented Shibboleth/SAML 2. I understand that Shibb will support group attributes, but then we will have to figure out how to get those attributes as 'filters' in Weblogic before sending 'remote_user' to Apex. Or maybe there is a way to get the group attribute to Apex? I assume that you remain in the configuration explained in above comments: SAML2 protocol, CAS as IdP and Weblogic as SP. Also I am assuming that the CAS SAMLResponse include a "Groups" attribute. Sorry for this very late follow up, but we just went to production with out Apex 4.2.2 environment and using CAS authentication. We also implemented Listener 2.0.2 and RESTful web services for a pilot project which has gone very well. We used basic auth for the web services but would like to use Oauth2 capability in future. Thank you so much for the help with CAS. Now our architecture group wants us to pursue Shibboleth integration for authorization groups. So we will be in touch!!! Thanks for your feedback above which we will use in trying to implement Shib. Great, these are really good news, congratulations!!! I am very happy to know that my little collaboration helped you in your project. I am 'resurrecting' this thread. Hope you are still watching it! Since we are also asked to use Shibboleth groups attribute, is the complete filtering for groups done in Weblogic and so only the appropriately filtered users come through to Apex from the web.xml? Apex just accepts the user through the http_header_variable correct? If Apex needs to 'know' about groups, not sure how that would be passed to the app. Ideal would be that Weblogic 'filters' the users so only the appropriate group get to the application. Is there a chance you can provide an example of web.xml that would include how group attributes or assertions are mapped in Weblogic? In this way you do not need to pass any other header to the APEX application. APEX will accept any header that you add in your filter. You can get it in your application like any other header. I think so, cause most of the configuration is done on the managed server level. For SSO between applications you can also use the same user only both applications need to be careful with the same session beans and both apps need to have the same cookie path. The question is how will the client distinguish between those two different sessions? "Go back to the SAML2 authentication provider where we will import the identity provider metadata xml." Are you referring to the identity server or Service Provider Server when you state SAML2 authentication provider. I note that the screenshot states saml2CPM ? A few steps later you have the instruction " Now we do the same for metadata xml of the service provider, We need to import this in the Credential Mapper provider of the Identity Provider"
I would really appreciate it if you could clarify this. Well actually this post belongs to Edwind, I just add comments from time to time, by the way thanks Edwin! Ok, it depends in what you want to do. In my case I am configuring Weblogic as a Service Provider, so I need to create an "Authentication Provider" and populate it with the Identity Provider Metadata (importing it). ps: is this what you are trying to accomplish? Hi Luis, thanks for the clarification. I am trying to use an external identity provider (wso2 identity services) and expose that to accomplish SSO in weblogic server. Configure Service provider to utilize this. - Create a SAML Authentication Provider: Home >Summary of Security Realms >myrealm >Providers, click new and in the form just select SAML Authenticator. Here you just need to adjust the JAAS control flag. For our domains we set it to "SUFFICIENT"
- Configure your federation services: Environment > Servers > ServerName > Configuration > Federation Services > SAML 2.0 General. Once you have configured them you need to publish the metadata (xml file) and register it in your IdP. Of course, if you prefer, you can script (WLST) all of these. I am currently looking into how I can generate the wso2 idp metadata file. There doesn't seem to be a way to register an SP in wso2 via an SP metadata file. Its purely by entering the relevant config data. Getting the idp file for wso2 is my first task. I want to extract roles from the Identity Asserter. And have implemented custom Attribute & Name Mapper Classes. I can set them correctly on the Partner and the asserter. I.e they are in the classpath. However they are never called. On wso2 you have a consumer Assertion URL that the assertion is returned to. Its a mandatory value. Is there a default URL that I can use to send the response to the SP directly? or some configuration setting that ensures that all assertion responses are sent back to the Identity Asserter? In your identity asserter (Home >Summary of Security Realms >myrealm >Providers >yourIdentityAsserter) you need to declare your mapper filling the Name Mapper Class Name field of the Configuration > Provider Specific tab. If not it will never be invoked. Is it possible to use this same approach of SSO with two apps deployed in the same Weblogic domain? But different managed servers? the subject needs to be added as a principal in WLS so that my application can pick up the login permissions and roles of the user. In the logs I am not seeing any evidence that the assertion is returning to weblogic as the mapper class never kicks in . Have you registered your mapper class in "Home >Summary of Security Realms >myrealm >Providers >yourIdentityAsserter" "Name Mapper Class Name" field? Keep in mind that the configuration (Federation Services) of each of the managed servers will be different. Indeed it works between Weblogic managed server - same domain. Now I'm facing a new issue, maybe related to what you've said: mixed sessions. When I log in appA and then access appB the SSO works fine. But if I try to access appA after it, the login screen shows up. I inspected the JSESSIONID cookie and it is being overwritten. I've tried to create a virtual host to each application but then the SSO doesn't work. Side effect: either you deploy the applications in different managed servers (you will need different saml2 endpoints for each) or put in place several RequestHeader in order to modify the JSESSIONID path and domain. Luis, THANKS A LOT!!!!!!!! You are the man!! You are welcome! Thanks to you for showing up this issue. It recalls me that I have to gather all the different scenarios that we are facing. Any ideas as to why its not available? ps: the response to that request should be a 400 Error "Bad Request"
Hi Luis, it's me again. In the previous scenario that I've described: SSO between managed servers (and same weblogic domain). And I'm facing the same problem. Header edit Set-Cookie "^(_WL_AUTHCOOKIE_JSESSIONID=. *; [Pp]ath=)/(. *)$" "your_wls_Cluster$1/$2"
Header edit Set-Cookie "^(JSESSIONID=. *; [Pp]ath=)/(. *)$" "your_wls_Cluster$1/$2"
RequestHeader edit Cookie "^([ ]*|. *;[ ]*)JSESSIONID=(.*)([;]? [ ]*|;. *)$" "$1legacyJSESSIONID=$2$3"
RequestHeader edit Cookie "^([ ]*|. *;[ ]*)_WL_AUTHCOOKIE_JSESSIONID=(.*)([;]? [ ]*|;. *)$" "$1legacy_WL_AUTHCOOKIE_JSESSIONID=$2$3"
RequestHeader edit Cookie "^([ ]*|. *;[ ]*)your_wls_Cluster_JSESSIONID=(.*)([;]? [ ]*|;. *)$" "$1JSESSIONID=$2$3"
RequestHeader edit Cookie "^([ ]*|. *;[ ]*)your_wls_Cluster_WL_AUTHCOOKIE_JSESSIONID=(.*)([;]? [ ]*|;. *)$" "$1_WL_AUTHCOOKIE_JSESSIONID=$2$3"
Another question, there is also a feature of Single Log Out for SAML2? I'm trying to implement a simple Servlet to provide SLO capabilities on Weblogic. Can you explain how to get the SAMLRequest and SAMLResponse attributes ? I've tried using request.getParameter("SAMLResponse" but didn't work. My domain has Artifact binding and I also test with HTTP Post. I already saw you post on stackoverflow but it's not clear for me yet. Can you clarify this simple point ? 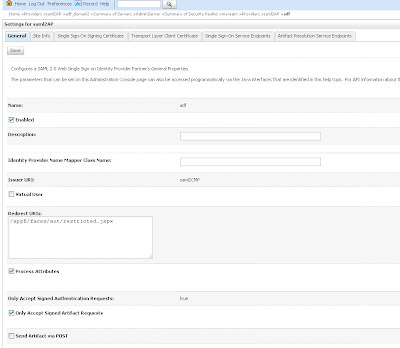 One more question, in my scenario I have IdP and Sp on Weblogic, do you know if it's possible to execute the SLO ? In your example you use ADFS2 as IdP correct ? You are welcome! Very glad to know that it helped you, great! Sure, it should not be a problem. Yes, Shibboleth is a good choice. Me, for my tests, I have setup OpenAM as IdP. It is very simple. Hi Luis, thanks for all your help MyAttributeMapper class is kicking in. I have seen all sorts of examples of creating custom principals. I just need to authorize the user based on role details in the SAML assertion for now. Could you point me to some working code for this please, I've tried a few examples and different means of doing so but none work. For the mapper I have two implementations, one that creates an instance of YourCustomWlsUserPrincipal, filling the ArrayList of groups, and a second one that creates one instance of YourCustomWlsUserPrincipal and one instance of YourCustomWlsGroupPrincipal per group taken from the SAMLResponse. Thanks ever so much Luis that worked a treat. I have configured my Jdev Integrated WLS as SP and deployed a security enabled ADF application. The IdP is the Ping Federate server maintained by my client. The setup is all completed by exchanging the metadata files and making all the necessary configurations in the Federation Services -> SAML 2 Service Provider end. Now, when I try to access my application, I see that the request is redirected to IdP and even the IdP is responding back with saml response posting it to ../saml2/sp/acs/post. The URL looks fine. but the browser is showing 404. Any ideas on what must have gone wrong. 2. You have not enabled the "POST Binding Enabled" of your "SAML 2.0 Service Provider"
I am assuming that you want to use the POST-BINDING. Try to access the other endpoint (artifact bindng) /saml2/sp/ars/soap... you should get a 500 error. This means that at least your saml2 module is running. Finally I would recommend you to enable the SAML2 debug traces (see Edwin's comments above), they are really useful! My application is rightly configured. On keenly observing the logs, I realized that the IdP is returning me a SAML Response with a different Issuer Id. Hence, The SAML Identity Assertion is rejecting it as it is not expecting a response from it. Great! So I do believe that updating your relying party in your IdP the authentication should start working. I have configured weblogic as SP and OPENSSO as idp. I get the below error invalid issuer. org.opensaml.xml.validation.ValidationException: [Security:096536]Invalid issuer format: urn:oasis:names:tc:SAML:2.0:nameid-format:entity. mmm, I can recommend you to check the "entityID", of your IdP (OPENSSO). I am not sure if is mandatory, but we always use urls, like entityID="https://idp.domain/login". Can you guys help me with a solution for the above error. Check the value of the "Issuer" element. Here is my response and it sounds good to me. I am afraid that paste the encoded response is not very helpful for solving this issue. I can recommend you to use https://rnd.feide.no/simplesaml/module.php/saml2debug/debug.php for decoding your SAML messages. If you are a Firefox user take a look at the SAML tracer. No problem, I figured out the issue. It works now. the IDP initiated flow works. Can you give me some guidance how can i do a SP initiated login where i access weblogic and get redirected back to IDP for authentication. It redirect to Saml Url http://localhost:7005/saml2/idp/login and 404 Not Found "The requested URL [URL] was not found on this server" and can not continue , how I can deal with situation means how I can access resource page from destination to another destination? from (http://localhost:7003/App2/welcome.jsp) to (http://localhost:7005/App2/welcome.jsp) without facing this issue and does not need for asking user name&password again . Any ideas would be appreciated. do you use auth-method CLIENT-CERT on app2 and app3 , I don't know what goes wrong but I suspect that it should do a re-direct to http://localhost:7001/App1 which has basic authentication and after this go back to app3. and set these parameters to see the output. It seems that m_server2 needs to be configured as Identity Provider. See http://docs.oracle.com/cd/E23943_01/web.1111/e13707/saml.htm#i1107127 "Configuring an Identity Provider Site for SAML 2.0 Single Sign-On"
For these kind of exercise I would recommend you to have a different Identity Provider, like Shibboleth, OpenAM, ADFS, etc... and let your Weblogic servers be the Service Providers. IMHO it makes the "big picture" of your infrastructure pretty much clean. I created a SAML with Hyperion EPM system. The document says me to put the SP initiated protection /interop/*. When i do that, Weblogic goes back and forth to infinite looping. I can see i am authenticated and again it goes back to my IDP with authentication Request. Any idea on this? Below is my log.Spliting into two posts. This issue use to happen to us when we specified the cookie-path in the weblogic.xml of our applications. You can check if this is also the case for you. I have took a quick look to your pdf document and we, for our Service Providers, add /saml2 context to the Published Site URL (https://HypOHSServer:HypOHSPort/saml2) Maybe to use https instead of http could be more convenient. I have not put the assertions, since i am not able to post so big. But the reality is, it reads the assertion and mapping the user. going back for the loop. IDP initiated is working fine. I used the following document to configure. In the document i can see SSODiag app works fine. Only interop keeps looping in SP initiated scenario. Sorry i dont see the log. Here you go. I found this. Actually When i access http://win-citrix.krish.com:9000/interop/ i receive this issue but if i access http://win-citrix.krish.com:9000/interop/index.jsp it works fine. May be after SAML authentication it does not sending to index.jsp and looping. That is what i see an issue, probably an bug. I have a scenario where I need to configure 2 saml wars in a single weblogic domain. How can I configure 2 saml2 wars for 2 different application in a single weblogic domains. I have deployed one IDP and two SP applications in a three independent weblogic domains on its own clusters and then i added the necessary SAML2 configurations in the idp and 2 sp servers. Now, Iam able to login to the SP applications through IDP login screen and able to visit the protected pages (role based) in the individual SP application without any issues. But my requirement additionally says that if the user logins in one SP application then he should be able to visit the protected pages of other SP application also. User should not be asked to re-login again for the second SP application. 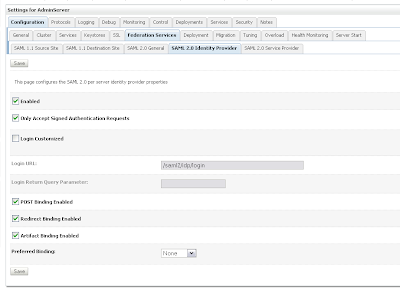 But in reality on my setup/configuration, each service provider asks for the saml2 assertion from the IDP individually. So it asks for the re-login again, if the user moves from one sp application to another sp application using the link provided in the first sp application..
What is the additional configuration should be done to make it work as a real SSO with the above said feature? Your help is very much appreciated. Advance thanks..
first of all, i would like to thank you for writing great post. i have a question, is there an option to disable response signing on identity provider settings ? Using WLST how to Publish SAML 2.0 Meta Data? # os.environ A mapping object representing the string environment. For example, environ['HOME'] is the pathname of your home directory (on some platforms), and is equivalent to getenv("HOME") in C.
print "ERROR: " + str(ex) + "!" I also have JSESSIONID overriding issue. I tried to rename cookie in mod_wl config file as you described above. But it did not work. Can you please write in more detail about configurations on web server and application side? Hello Biemond, I have successfully implemented SAML2 with ADFS as the IDP and Weblogic as the SP. The problem is, I cannot retrieve any SAML2 attributes to populate into a HEADER variable so I can log the user into the application, does that make sense? I clearly see my SAML 2 information in the logs but no HEADER variables are being populated. How do I take SAML2 attributes and pass into HEADER variables? servlet filter? I will document both a bit in the Readme.md. I am beginner with SAML and Weblogic server. I am doing one POC for single sign on. I have created two application on two different domain, deployed on two Weblogic servers on same machine. I just have created a static link to go to service provider page and I did all the configurations mentioned in the blog. But when I click to access the page of service provider, it is still asking for credentials. It is not giving single sign on. I have given below mentioned url as Published site URL in server1(identity provider application) configuration. I have given below mentioned url as Published site URL in server2 (service provider application) configuration. my JSP on service side is index.jsp. I have configured below mentioned URL in redirect URLs after importing metadata.xml of IDP. I am beginner with SAML and Weblogic server. I have read and understood the oracle article for SAML with weblogic some what and I dong one sample project for single sign on. Is possible to use SAML in two different domains that using different Authentication Providers? Can I log inside the first domain as userX and access into the second domain that doesn't have the userX? I am not sure to follow you... The answer to your question is yes, nothing stops you to declare different authentication providers in two (or more different domains). For both domains the authentication will be provided by your IdP. We have implemented the SSO using the SAML2 and OBIEE 11.7 successfully . 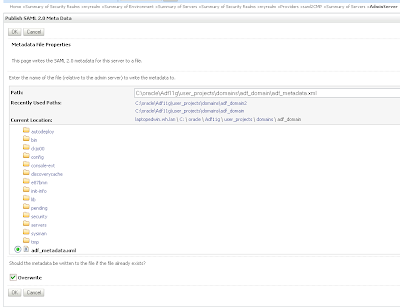 We have integrated the OBIEE reports using iframe component in j2ee applications .On click of logout button we are able to logout the application successfully ,but subsequently if any user try to login with different user and try access the OBIEE reports , the reports are displaying related to previous logged in user . It means Service provider not destroying the session cookies . I have tried below possible options ,but issues still exists . As per the "Luis" comments above ,we have tried to use the custom logout functionality mentioned on "https://github.com/cerndb/wls-cern-sso/tree/master/saml2slo"
algorithm:We can use the same algorithm mentioned on web.xml ? SigAlg: signature algorithm specified in the logout request/response URL. 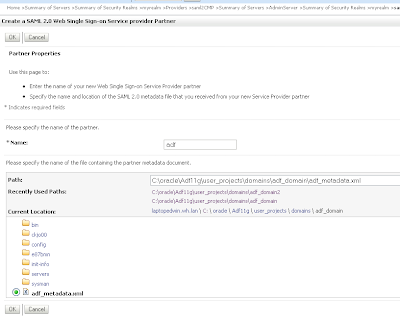 idpEndpoint: SSO endpoint where to send the samlp:LogoutResponse. Can you explain more about this field ? getPasswdScript: What parameters need to pass on this field ? keystorePasswordKey: Which value we need pass on this fields ? privateKeyPasswordKey: Which value we need pass on this fields ? ssoSignOutUrl: SSO Single Log Out URL. I used it to initialize the redirect URL used by the SAML2sloServlet to redirect the response. It will be override by the idpEndpoint + samlp:LogoutResponse. Note : I have tried to deploy the samlwlo.war file without modifying any , the deployment failing due to the web.xml context-param fields. Please provide information about the Web.xml fields which are mentioned above ? and also please confirm us do we need to modify any other files in samlslo.war apart from web.xml ? I am trying to run you single logout solution in my environment. In you web.xml, you have mentioned "/ORA/dbs01/syscontrol/projects/systools/bin/get_passwd" for geting the password, but I am not able to find the file anywhere. Can you share a sample file so that I can create a similar one? Actually I think that I should remove that reference. We use that script to get the password of the JVM keystore. E.g. If you want to do a "dummy test" just creates an script that echoes your keystore password. But when my idp decrypt the assertions ( he have to decrypt assertions in order to go from testing to production ) I am not able to get that assertions, I red that Web logic doesn't support encrypted assertions, is that true? In this case what can I do ? 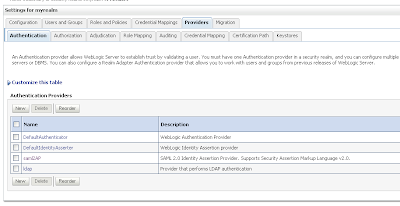 I have configured SSO for Webcenter Portal in weblogic. When I try login with the SP initiated URL (Webcenter Portal app URL), it will redirect to the Identity provider login page. I have set the Bad password count to 5. On entering the bad password for the 5th time, the browser is redirected to 403 not authorized page in the Weblogic ACS page - http://hostname:port/saml2/sp/acs/post. How this is handled in weblogic? How to cosume the assertion and build a customized error page for this request.